There has been growing talk about the potential for Treasury illiquidity. Studies have focused on the micro dynamics of the markets and flash crashes, but liquidity will be driven in these macro markets by the distribution and use of information. Liquidity will ultimately be an information problem between those that have it relative to others who do not, the form of new information, and how new information changes expectations. Information reaction and cascades will be the real driver of liquidity problems and these are hard to measure. Information shocks may not explain the flash crashes, but it will be the driver of the real liquidity threat which will be associated with large changes in market expectations and herding behavior. Market liquidity is generated through two-sided markets with depth on both sides. Large orders will not disrupt prices because there is enough differences of opinion to take the other side of a trade. Consequently, there have to be a large number of traders who have heterogeneous expectations. If the market becomes more concentrated into the hands of fewer dealers or fewer large traders, there will be a greater likelihood for a liquidity events. Difference of opinion are critical because if there is similarity in opinion and the drivers of those opinions, there is more likely to be information events or shocks that will be one sided. Similarly if there are large players in the market, it may cause smaller players to follow the larger trader's behavior and cause information cascades. There will be herding if threes the belief that one side has a information advantage and the only rational approach is to follow market action. Liquidity may become a significant problem if there is a general belief that the Fed will be raising rates. If the market believes that Fed policy and forward guidance through their words and actions will be credible and continual, the market will become one-sided and create a liquidity shortage. This should be a real fear in the next month. Of course, this is a an extreme. There usually will be enough differences of opinion about the intensity and timing of the rate increases which will make for two-sided markets; however, it is good to explore what could be the causes of liquidity shortages and agreement about what the Fed will do or not do is good place to start thinking about one-sidedness and liquidity. Illiquidity will be the price of asymmetric information and expectations. 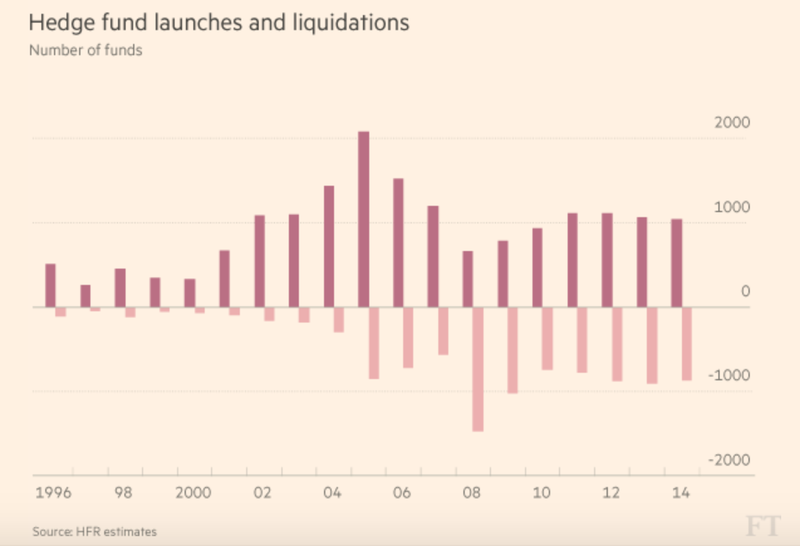 Hedge funds launches, albeit off the lows from the Financial Crisis, have plateaued. Hedge fund liquidations don't match the declines of 2008-09, but have been steady. The post-crisis hedge fund world is more unforgiving for managers. The days of the smart manager hanging out his shingle and trying to build a business is over. Hedge funds should be a great entrepreneurial industry. The amount of capital needed is low. The only barrier to entry is skill. You should just need a good track record and a story and you should be able to attract money; however, that is not how the industry is working. The costs within the business have been going up in three areas. One, the regulatory and compliance costs have increased substantially. You could add in the cost of due diligence which makes infrastructure more critical to the selection process. Two, the cost of marketing has increased. First, the broader distribution process means that there is needed a large network for sales and marketing. Pension consultants also control more of the money flow in hedge funds which means a longer lead time and more work to show that the probability of failure has been reduced. The market is more divided into haves and have nots. Third, the banking and brokerage industry has increased the costs of transacting. It is not easy to get the clearing and brokerage lines in place to trade efficiently. We are not arguing that all of these changes are bad. There needed to be more standards and regulation. Marketing has changed and the ability to use third party services is all but gone. The cost of trading has gone up with the cost of capital for banks. The minimum necessary to make a good living is much higher than 10 years ago nd we have not even factored in the pressure on lower fees. The hedge fund industry is maturing and the age of the individual talent starting his shop is ending. Self-control and due diligence - Can traders control their urges? One of the key characteristics of good traders is self-control and due diligence should explicitly take this quality into account when managers are reviewed. Those who do not possess self-control should not be given money because it is unlikely that the good performance of today will be followed by strong performance tomorrow. 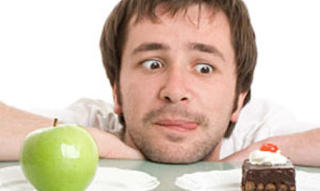 Self-control is a key trading skill. The good manager can control investment urges. Bad managers will not be able to show self-control in difficult times and will likely change strategies or behavior. A review of self-control may seem like a strange area of discussion for due diligence. If a manager is rational, there is no need to discuss self-control because the rational economic man, homo economicus will always be a profit maximizing or optimizing individual who will be able to discount all information quickly, efficiently, and correctly. However, we know that is not the case through all of the work in behavioral finance. Those in the homo economics school will say that any action the manager takes is rational and profit maximizing because he would not otherwise take it. This tautological approach does not address the real world problem that managers often face - an environment that is uncertain and often vague. Hence, it is relevant to try and measure or discuss the self-control of traders. Some researchers have modeled the problem of self-control as an principal-agent issue between a far-sighted planner and a myopic doer. The focus was a problem of intertemporal choice. There is a doer within us who wants to always take immediate action or look for immediate gratification while our long-term planning self tries to stay on task and think in terms of longer goals. In this problem the long-term principal has to monitor and set controls on the agent. A similar issue can be described with trading when there is short-sighted reaction against longer-term goals. There are two key methods or focus areas for imposing self-control, cues and commitments. Self-control tries to eliminate cues that will trigger short-sightedness and use cues to help ensure tasks will get done. For example, if we remove temptation with desserts, we will stay on our healthy eating program. Good self-control takes away those things that will trigger non-maximizing behavior. Good traders are able to block out extraneous information or "noise" and focus on what they believe to be truly important. Due diligence may involve determining what are the cues used or blocked by the manager to stay on task or focus. It could be as simple of following a process or the use of specific information. Commitment is a form of binding behavior to impose self-control. Following a model is a form of commitment. The use of stops to get out of positions is a form of commitment. Commitments stop bad behavior and forces discipline on a manager. The due diligence process should identify the commitment process for each trader. If cues and commitment cannot be identified, then it will be hard to argue that there is a process to generate self-control. Of course, due diligence can also pass into the personal to determine whether there is self-control in non-investment activities. Simply put, control the urges for bad behavior and loses should be controlled. We have had flash crashes in equities, Treasuries, and foreign exchange. 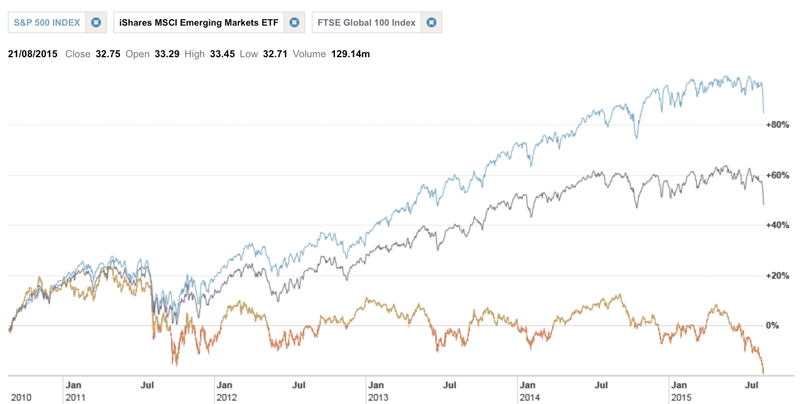 The three biggest, deepest, and most liquid markets in the world. We may have had a multitude of mini-flash crashes in ETF's, individual stocks, or markets that have significant declines and liquidity shortages over limited time periods. The Monday open price declines for a number of ETF's may qualify as a flash crash although in a different era we may have called just an opening order imbalance. All have the qualities of a short-term order imbalance which leads to a sharp price decline. The order imbalance could just be pulling orders on one side of the market as opposed excessive orders on the other side of the market. 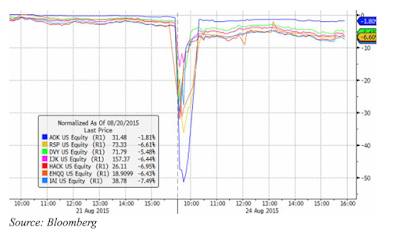 Flash crashes have come and gone so why should we care? The markets have bounced back after these crashes with limited after effects. Except they really don't just jump back to normal. A study from the NY Fed suggests that market depth declines for a number of days after the flash crash; however, we think the impact has even stronger ramifications especially for systematic traders. If you run a program with stops, your worst nightmare will be for the ammeter to run through your stops only to return to the original prices after a few minutes. You are not being paid to be prudent which changes the complexion of trading. The market integrity is compromised and risk management has to adapt. The adaption will usually entail some reduction in risk taking which will likely hurt performance relative to what would have been produced in the past. Studies have done a good job of showing what happened to the markets around the flash crash but I have not seen a good explanation or model for why these events occur or how they can be forecasted. Fear comes when a phenomena cannot be explained. 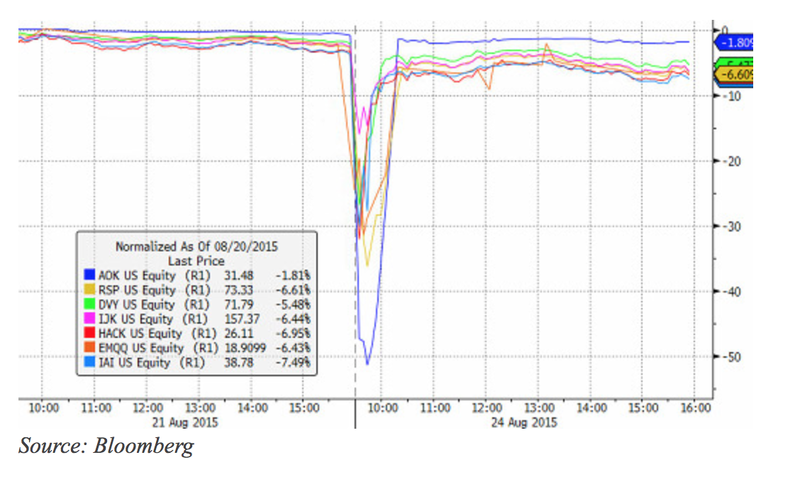 Flash crashes create market fear. 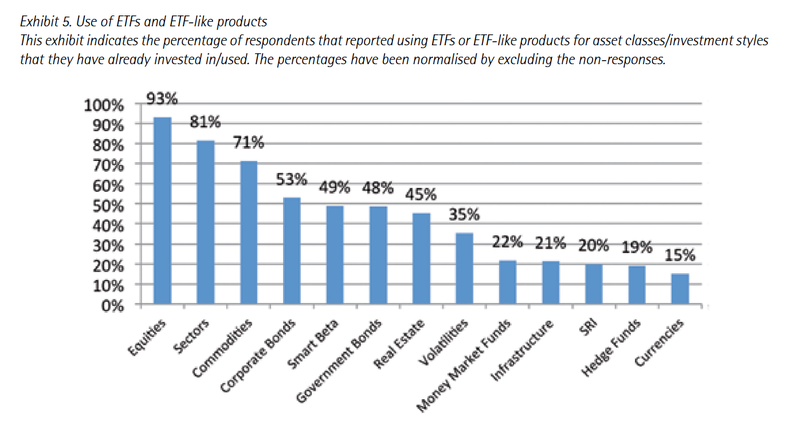 The power of the ETF market is its ability to provide immediacy for investors. You can transact like a stock and trade every day. Liquidity is as good or better than a mutual fund and the fees can be low. However, there is a problem if the immediacy of the ETF is greater or expected to be greater than the underlying assets that constitute the ETF. This is a massive liquidity problem waiting to happen. 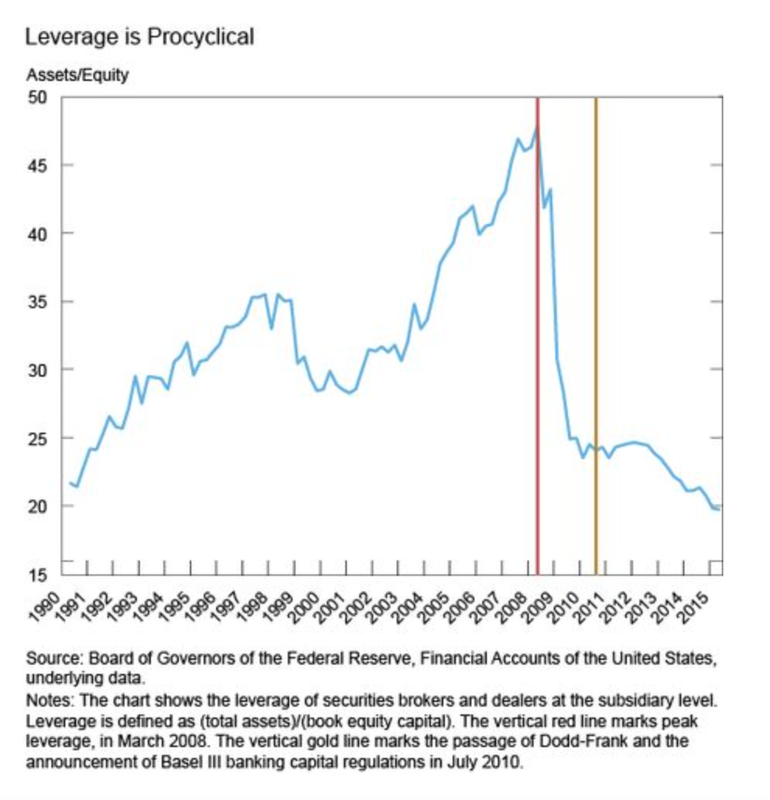 No, it is a liquidity problem that has already happened and may only get worse. The first chart from Citibank shows the size of mutual fund and ETF assets relative to dealer inventory. Dealers are supposed provide liquidity to the market, but that is not likely if they do not have the ability to warehouse securities in size. There is no way market-makers will be able to support outflows. 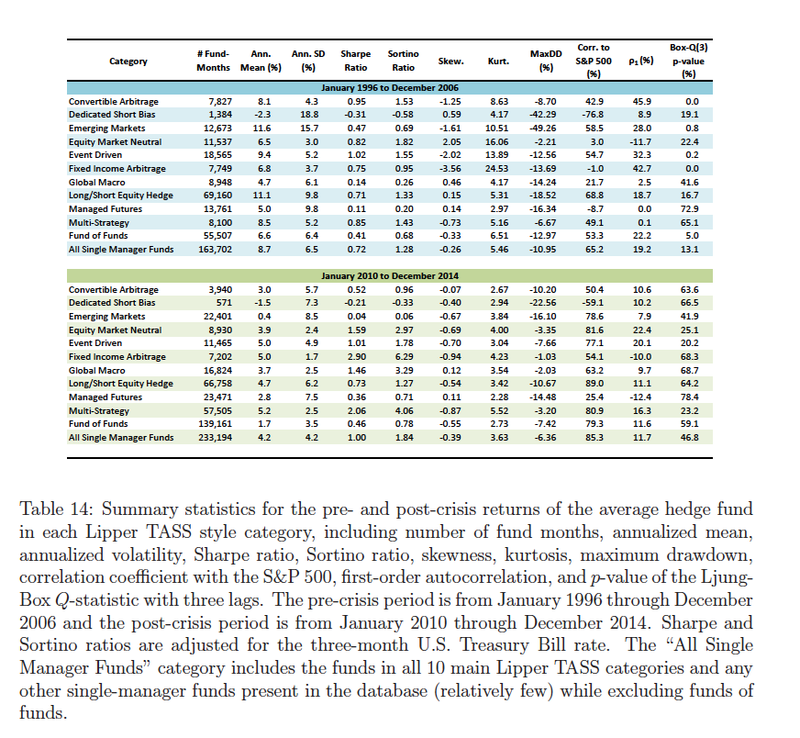 The second graph shows how large mutual funds are relative to other investor types. They are more important than households and match insurance company assets. 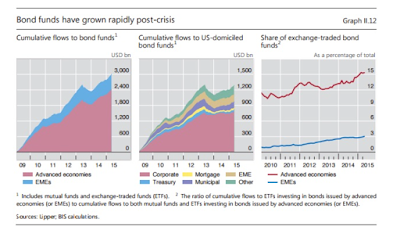 The second set of charts from the BIS shows the money that has flowed into bond funds. Previously, bond were held by investors who were more likely to house until maturity. That is not the case for bond funds. These funds offer daily liquidity, but there are unlikely to be enough immediate buyers if there are large bond fund sellers. The only way prices can remain steady is if the outflows are matched by inflows at the same time. This likelihood is slim. The result of less liquidity will be higher volatility and jumps in prices. We have not yet seen the impact of these types of liquidity events because so much has been inflows from investors searching for yield. If the direction of flows changes, there will be a liquidity problem. How do we know this will be a big problem? Look at the behavior of some ETF's on Monday morning. No liquidity on the open made for price declines of well over 30%. The prices were more reflective of fair value at the end of the day, but for those who wanted to transact early in the session, it was a disaster. The prices reflected "fair" value when there are no buyers. Investors should be worried because marketing material does not discuss this problem. All traders should be worried because markets will not reflect reality. There will be a new reality of return jumps. The size of the US debt markets have increased significantly since the Financial Crisis, yet the role of fixed income dealers has actually diminished. 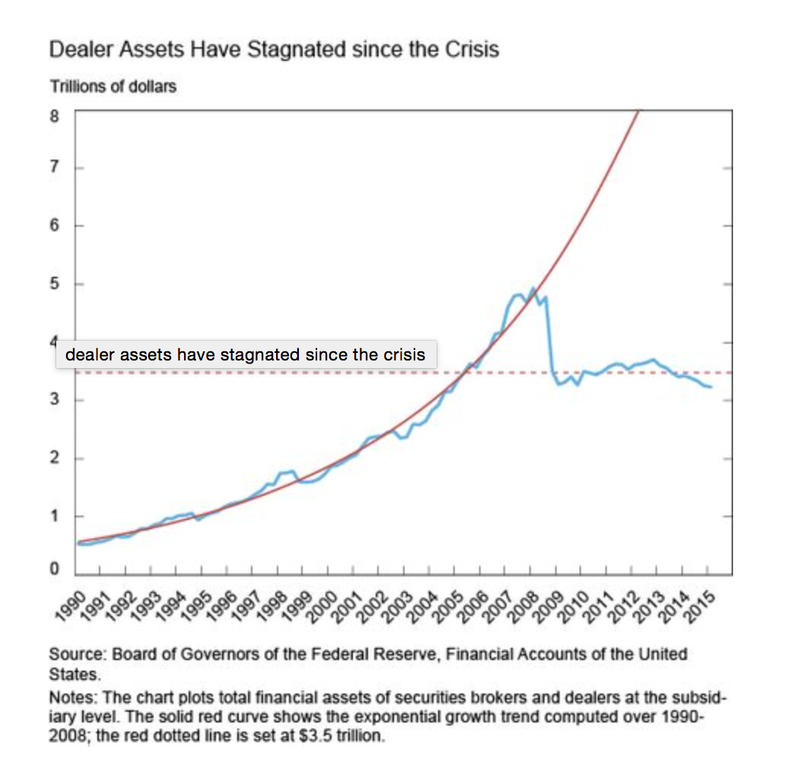 The assets held by dealers have declined over the last five years and is not even close to what was seen before the crisis. 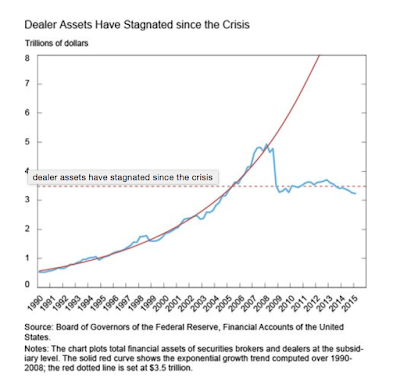 The assets/equity ratio of dealers has also been falling. Dealers are pulling back on their risk-taking in the largest OTC market. There have been some technology changes which make it easier to transact in the fixed income so some trades can actually be matched across large market participants. Unfortunately, the real story is that no one is committing capital to warehouse risk and help facilitate the process of matching buyers and sellers who do not come to the market at the same time. If there is no dealers to provide immediacy, what is going to happen to the price process? We know what the answer will be. There will be more price jumps and gaps. Volatility will go up and the integrity of the market will decline because it will be uncertain whether trades can get done immediately or at fair prices. The government wanted broker-dealers, especially those associated with banks, to delever. This was one of the key objectives of Dodd-Frank. Take leverage out of the system. Still, it is the second order effects that are always lurking in the background to cause trouble. 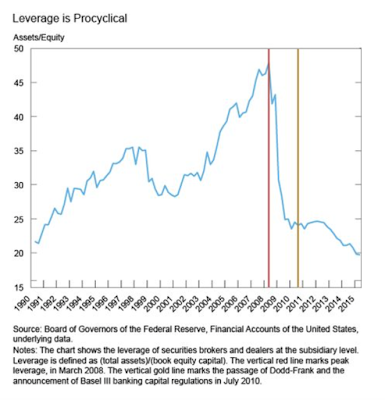 There is less dealer leverage, but the size of the debt markets do not reflect less leverage. The deleverage of dealers does not match any deleverage in the economy. So, who is going to help provide liquidity? Buying puts is supposed to be a good way to hedge downside risk, but the cost of such hedges can be expensive. Options can be valued to determine their richness or cheapness in the market. If you buy an option for an implied volatility, the value of that option can be viewed through the subsequent realized volatility. 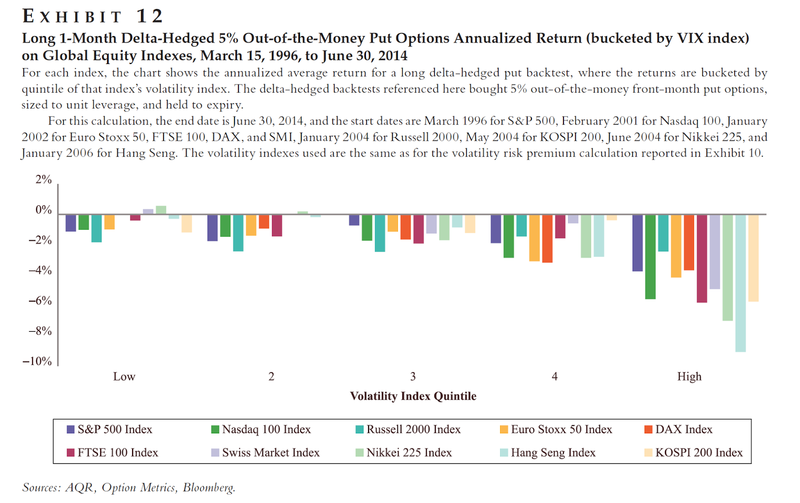 If the option's implied vol (IV) is less than the realized vol, the option is cheap. If the IV is high relative to the realized vol, it is rich. 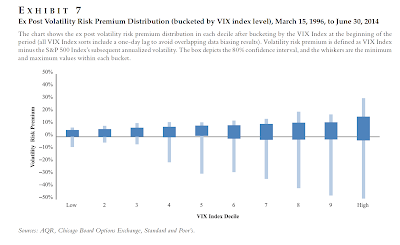 Consequently, we can look at the vol risk premium as measured by the IV versus realized volatility to get an idea of the true cost of a hedge as embedded in the price. 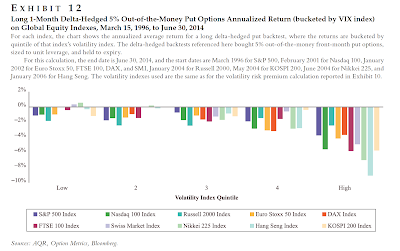 A new paper from the folks at AQR, "Still not cheap, portfolio protection in calm markets", provides an interesting perspective on using puts to protect from downside risk. They find that there is a positive risk premium such that put buyers are paying up for the right to hold an option. There is more bad news because the premium is usually higher when IV's are high; consequently when you try and hedge at those market extremes, it will cost more for the investor. Unfortunately, the premium also exists even when IV's are low. There is no getting around the fact that you have to pay-up for buying options. If you have to hedge, be careful of doing it when implied volatilities are high. Paying for the right to an option may not be the best way to gain protection. At the very least, determine whether you are paying an excessive premium for the option. The premium will not be known until the volatility is realized but by bucketing risks, you can get some idea of the true cost of hedging. If there is a crisis or just expectations of a downside event, investors want to buy put protection. For many, this is the main purpose of the options market, but there is a cost with buying this protection in the form skew. There is significant skew for out of the money puts that transcends no arbitrage conditions. With jump risk and stochastic volatility, there can be skew that is related to these two factors; however, in realty, skew seems to be independent or at least less dependent on jump risk and changing volatility. This skew behavior is a puzzle within the structure of a no arbitrage model, but can be explained by simple demand and supply between put buyers and the willingness of market-makers to write put options. As the demand for puts increases, there has to be sellers on the other side of the transaction, but if there are credit constraints on option writers, there will not be enough capital to match the demand. Consequently, the price of puts have to rise relative to at the money options. Hence, there is skew. This supply and demand story is nicely developed by George Constantinides and Lei Lan in their paper, "The supply and demand of S&P 500 put options." 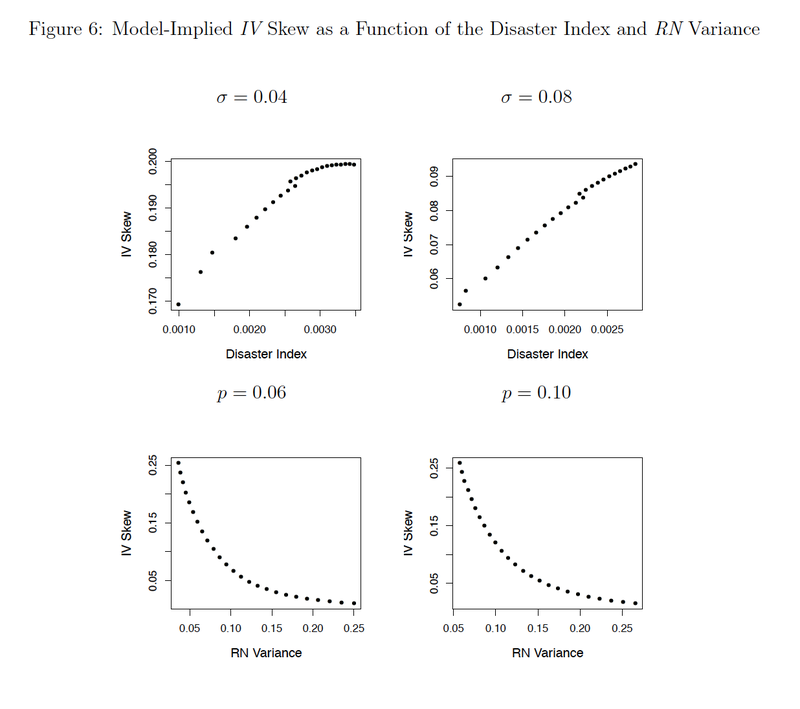 The authors find that skew is a non-decreasing function of the disaster index and risk neutral variance. 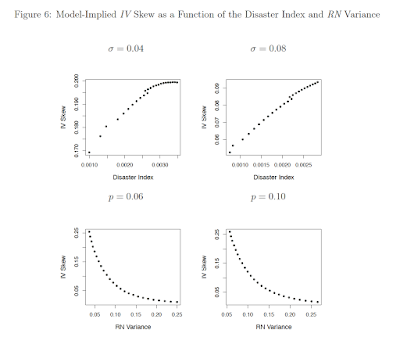 The disaster index in the difference between the integrated measure of implied volatility minus the VIX index squared, and the risk neutral variance is the VIX index squared. The disaster index can be thought of a measure of jump risk through looking at risk reversals. When disaster risk and variance increase, there is more put buying but writers may be constrained by the higher volatility which causes a imbalance that can only be corrected by higher premiums. Skew increases when border-dealers have a high liability to asset ratio and the more likely to be credit constrained. Demand pressure is not enough to have increased skew. Writers have to be constrained and need more return to undertake market-making. These results tell us that pricing for OTM put options can get more expensive in a crisis and investors need to pay-up for their hedges. When the crisis comes, it will be too late to buy cheap insurance. But, we have already figured that out. Insurance is expensive when the house is on fire. The markets have weathered Phase I adjustments of Fed policy with the end of QE. The market overhang of the taper is gone because the job has been completed, but we now trying to move into the new phase of the monetary cycle or adjustment to normalcy. 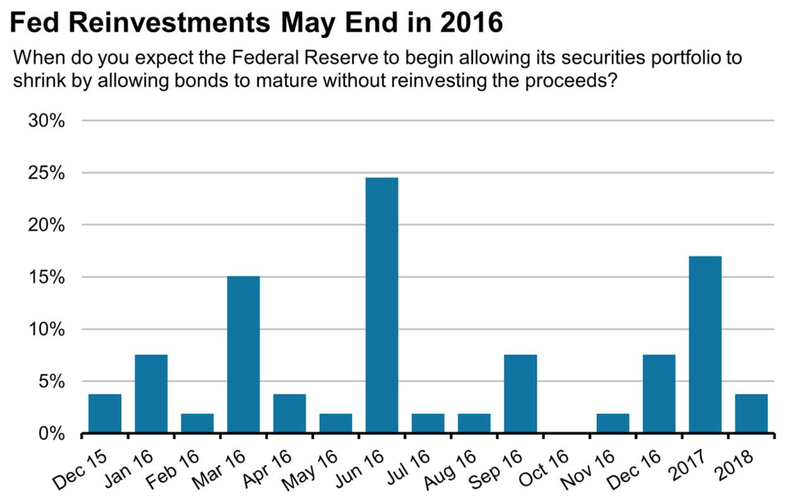 Although at this time, it seems as though the Fed may stay in limbo and not able to cross-over to Phase II. There seems to be a endless sets of reason for why a little more time is needed before we start the journey to normalcy. Just a little more time for condition to be just right. The market has not fully paid its toll, so the Fed cannot cross over the River Styx to the path of normalcy and the fed will not start the journey until ti believes the economic waters are perfectly calm. Now what is the toll for normalcy? It could be an adjustment in prices to reflect less leverage in asset markets. A return to monetary normalcy means a return to more rational credit markets where cheap money no longer hides unsound business and speculation. The toll seems to be an adjustment in equity markets regardless of what is happening in China. 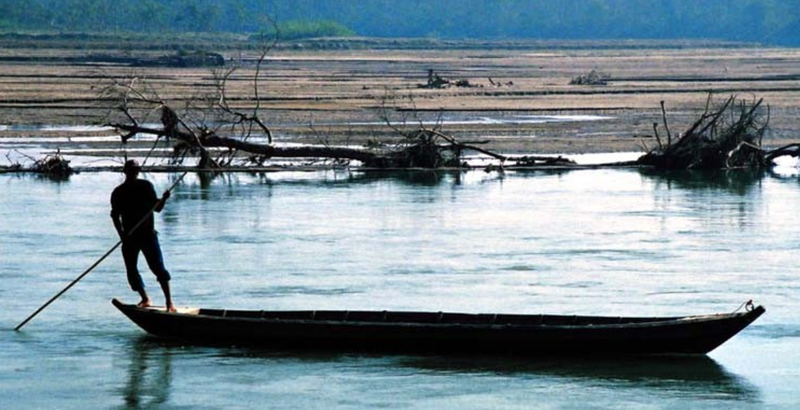 The toll is being paid, but that also means the economic waters will not be calm. Conditions for crossing to normalcy will never be perfect. What happens when we get to the other side of the river? If we had to articulate the process and impact of Phase II monetary policy, the answer is that it would not be easy to manage or explain. Just saying that there will be a normalization of rates when the Fed is sitting on a large balance sheet is too simplistic. 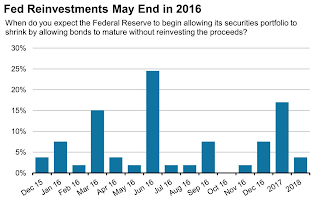 The adjustments in rates will not be through the Fed funds market but through reverse repo. The simple reduction in excess reserves will not be the process for raising rates. There will be a high level of uncertainty on what will happen when normalcy begins. 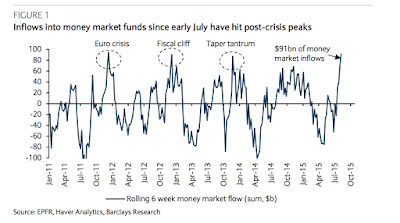 We cannot say that the present sell-off is associated with this uncertainty, but we can say that as more investors focus on Fed mechanics, there will be more volatility and uncertainty on what will happen in the biggest and most complex funding market in the world. 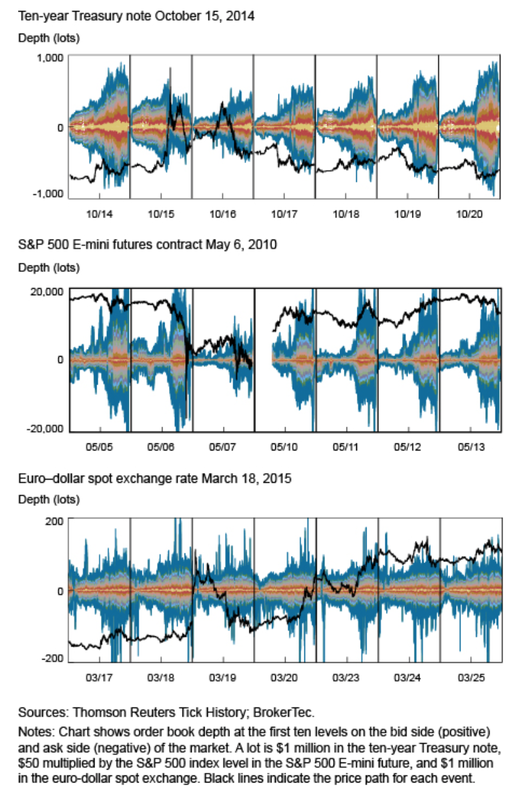 There is an ebb and flow of themes within global macro trading. These themes dominate trading and discussions. The list can change throughout the year with both additions and subtractions. Our chart shows some of the major themes in 2015 which shows a strong focus on China related events. Between China equity volatility, RMB devaluation, and the current stock decline, the macro focus is on China as the key driver. 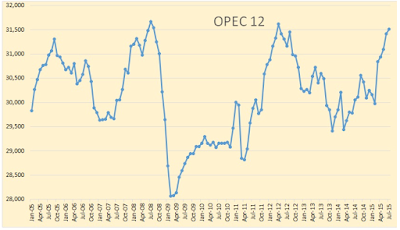 We could add in the decline in oil prices as a sign of an EM growth slowdown which is further related to China. Any delay with the a Fed lift-off may be driven by the fall-out from China. It is hard to image the Fed not looking closely at international events. The winter slowdown, the oil price decline in the first quarter, and the Greek Crisis all seem like distant memories relative to the focus on China. The current themes may fall off our list of key focus points for discussion, but the size of China and its potential impact make it seem unlikely. We will be discussing China growth and policy changes for the rest of the year. The performance of emerging markets has been horrible relative to global stock markets. It has bad for the last few years with emerging markets (EEM) moving sideways since the decline in commodity markets post-crisis peak. To some this has been surprising with analysts saying that emerging markets have changed and become more integrated to developed markets, but a close look at some of the research on emerging market equity risk premiums suggest that this story should have been expected. There should be a difference between the equity risk premium in developed and emerging markets; however, the difference between these ERP should change with the level of integration between these groups. In fact, integration will be the great equalizer and the basis for convergence in risk premium between developed and emerging markets. This is consistent from what we should expect with any trade integration. However, financial integration is not stable or one-directional. If there is an outflow of capital, there can be a decline in integration. The issue is how fast will this occur and are there other issues which cause differences in risk premia. Clearly, an increase in volatility differentials will change the risk premiums between developed and emerging markets. With the increase in volatility in emerging markets and declines in developed markets risk over the last few years, there will be a change in the risk premium differentials. Additionally, there are two other factors that have a strong effect on EM risk premiums. One, the global business cycle and two, overall market liquidity. The growth in emerging markets has been revised down a number of times of the last few years, so the global business cycle has turned against emerging markets. EM growth rates have disappointed the markets and economists. This disappointment is reflected in risk premiums. The downturn in commodities is another cycle that has worked against many EM countries. Liquidity, as measure by the capital flows into emerging markets, has also turned against these markets. With US rates up, capital flows have reversed. The decline in EM should not be overly surprising. The strong performance of the developed world is what should have been more surprising. This gap may be closing without the support of the Fed. In a risk parity world where investors want to hold a set amount of risk for an asset class, if there is an increase in market volatility, there should be a decline in market exposures. In an uncertain world where risk is hard to measure, there should be a shift to cash, so no risk is taken. Risks cannot be easily measured, the demand for the safe asset dominates. We have seen a significant increase in flows to money funds in the last few weeks. 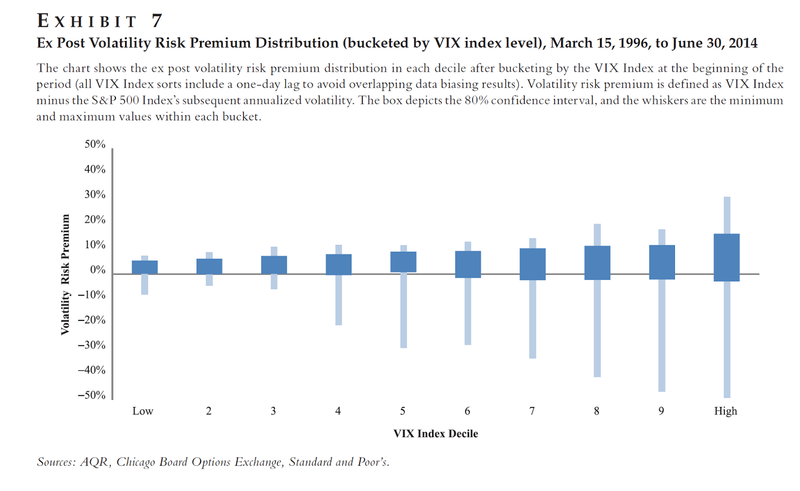 Risk has increased as measured by volatility, but there has been a much greater increase in non-measurable uncertainty. We just don't know how the China situation will play-out. We don't know what will be the reaction to a Fed increase or even whether it will occur in September. The direction of the market is not at all clear. 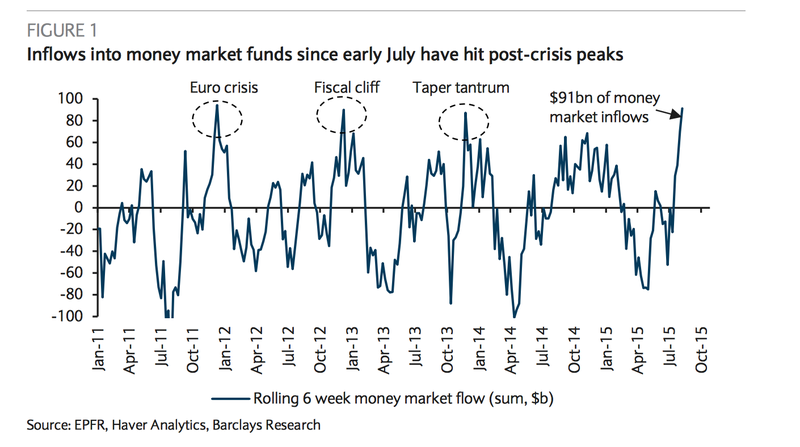 A close look at money fund flows shows that significant increases occurred during the Euro crisis, the Fiscal Cliff, and the Taper Tantrum. 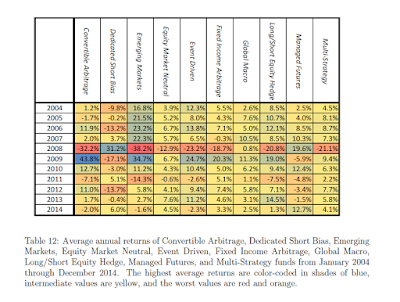 These were all periods of underperformance for risky assets. Money flowed out of risky assets and into cash. The market has to adjust in price to this reversal in flows. This is usually short-lived but will have real effects. Leveraging is out. Risk-off is on. The carry trade has been a mainstay in foreign currency trading, yet it has fallen on hard times in the post financial crisis period. Clearly, if there are no differences in interest rates across countries, there is no reason to buy the interest differential. The trades would be based on noise. The international rate markets are now seeing an increase in yield differentials. Some key countries who have forced interest rates to zero or lower are saying we don't want the cash. Differences in monetary policies are leading to differences in rates which may make carry more attractive. There will be more opportunities for carry trade to make a compact, but of course, this will not be without risks. In fact, this has been a poor period for the simple reason that current rates suggest that the US dollar should still be a funding currency. The dollar flows have been based on expected future differentials which will be more favorable toward dollar rate investments. Periods of transition to greater rate differentials can be filled with investment peril. Greater monetary policy uncertainty will translate into higher currency volatility. In a low manipulated interest rate world, it is harder to say what is a safe asset, a fair rate for sovereign risk, or a store of monetary value. With emerging markets still having higher rate differentials, there is the assumption that carry should work. That has not been the case and has been an investment failure over the last year. The key negative to carry trades is the higher volatility and the economic risks from a slowdown that will cause flow into safe assets. Carry has historically been a negative skew investment with a high correlation to equity or economic growth risk. The time to stay out of carry has been heightened in the current market environment. The premium is on safety not yield regardless of what the Fed is thinking. Asset management like any industry is often surrounded by trends and fads. A new buzz word that we are hearing about is goal or objective-oriented money management. This has been used more often by wealth management advisors, but we are seeing this thinking start to move into institutional money management. However, we do not think of this term as a fad, but a focus on providing more targeted investment solutions over just generating total return. Managing for objectives is not new, but there is a revived focus especially by hedge fund managers. This objectives focus is the result of a power shift within money management.With so many hedge funds and and money managers competing for the same clients, the negotiating power is switching to the investor and they want more focused service. The form of this service is having hedge fund managers meet or think more fully about plan objectives and how they can help meet these needs. If a pension fund needs a minimum acceptable rate of return, managers have to focus on delivering that return. If the investor wants a focus on factor diversification, then managers have to adjust their investment approaches. If investors do not want to pay for cheap beta, managers have to focus on unique alpha. Investors do not want to pay hedge fund fees for linear factors. They want diversified alpha production that will help offset liabilities. With index ETF's and alternative beta products competing with managers on performance and skill, managers have to generate customized service to enjoy non-discounted fees. Skill will be applied or developed to help meet the specific objectives of clients. Customization is in, and one size fits all funds are out. Separate accounts and specialized benchmarks are in. Large generic alpha or skill-base funds are out. Risk management that meets the specific risk aversion of the client is in. Investors can get generic returns in a host of cheap forms, so for premium pricing they want something that speaks to their needs. The managers that will thrive in this environment are those that are willing to adapt and customize their offering. There is a higher cost with these services but managers have to provide it or face fees that reflect a generic return product. The Saudi oil minister earlier in the year stated oil production will not be cut regardless of price. He is a man of his word. He argued that efficient oil producer should have a greater market share. 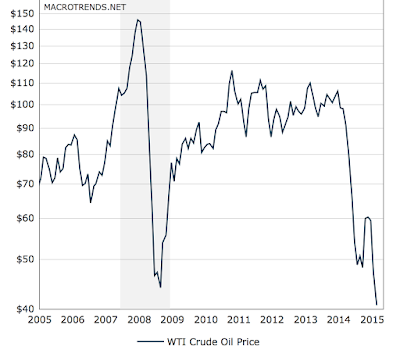 This is more complex conversation about profit-maximizing behavior of depletible resources, but focus is on the fact that OPEC at this point in not going to let price determine its policy. The policy has been to eliminate marginal producers who are creating a oil glut versus global demand. 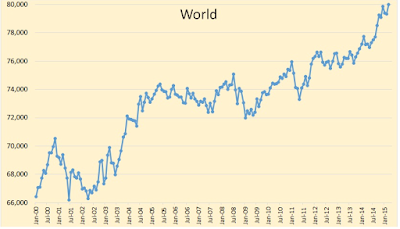 A look at oil production from the EIA show that the world is awash in oil. 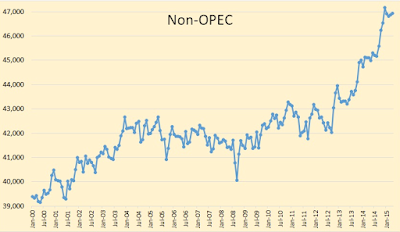 OPEC is pushing production to all-time highs although it has not broken through earlier production high. 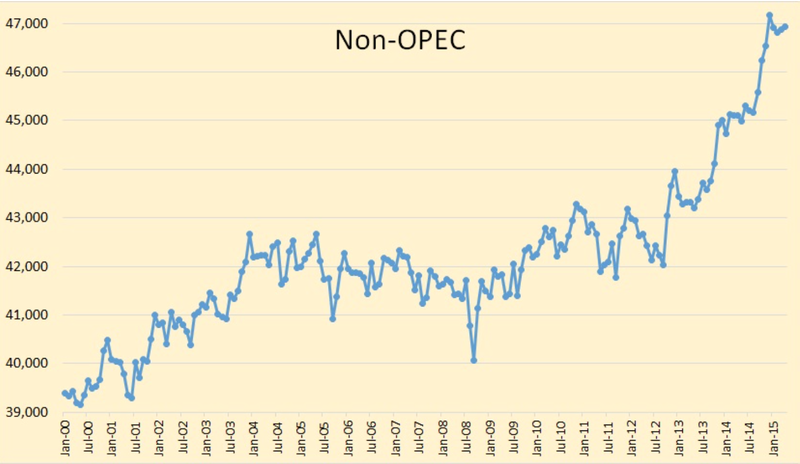 The non-OPEC world is where production is all of the excess production is still coming from. 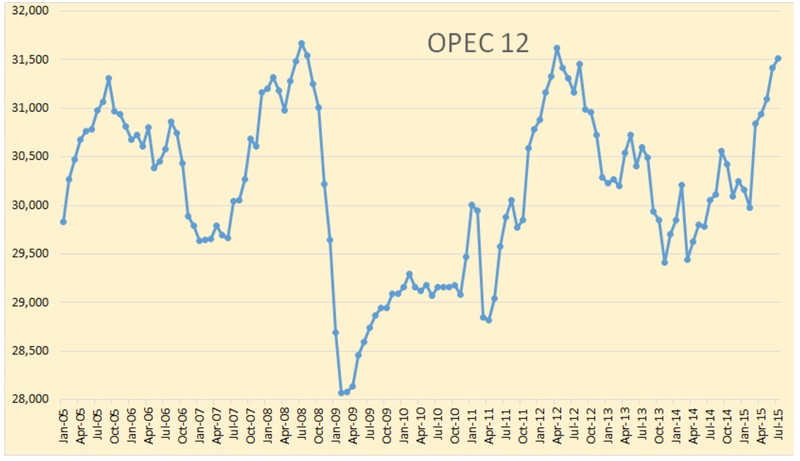 OPEC since the beginning of 2014 has raised production by just under 7% but non-OPEC production has increased by just less than 12 percent. The overall production increase has been up 5.25 percent. 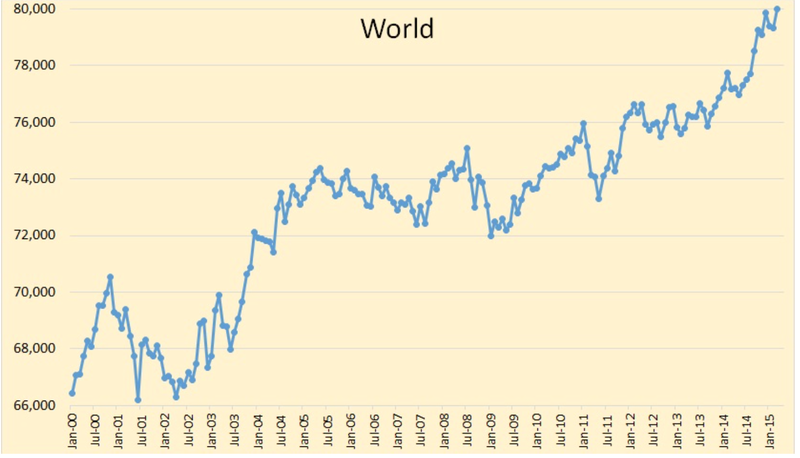 If world growth is less than this level, there will be excess supply. The current cost structure is such that production will continue and prices will fall because price is not yet equal to marginal cost for a lot of major producers. If there is excess supply, there are three possible solutions. They are not independent but work in tandem to create a stable price equilibrium. First, prices fall. Second, there is the alternative to demand usage which is building inventories. This is constrained by the amount of storage that available. 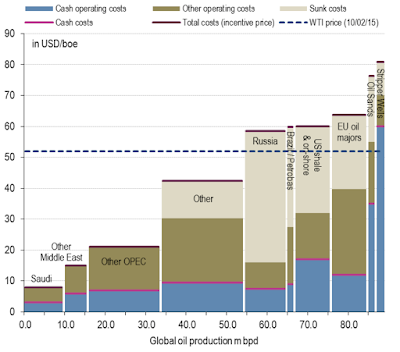 We have seen floating storage but there is a limit to where the market can put all of this oil. Third, there is a cut in production. Firms are cutting capital budgets. There has been a decline in rig counts, but what is really needed is a capping of well and less being pulled out of the ground. There has been some decline in shale oil production but not enough to have supply match current demand. 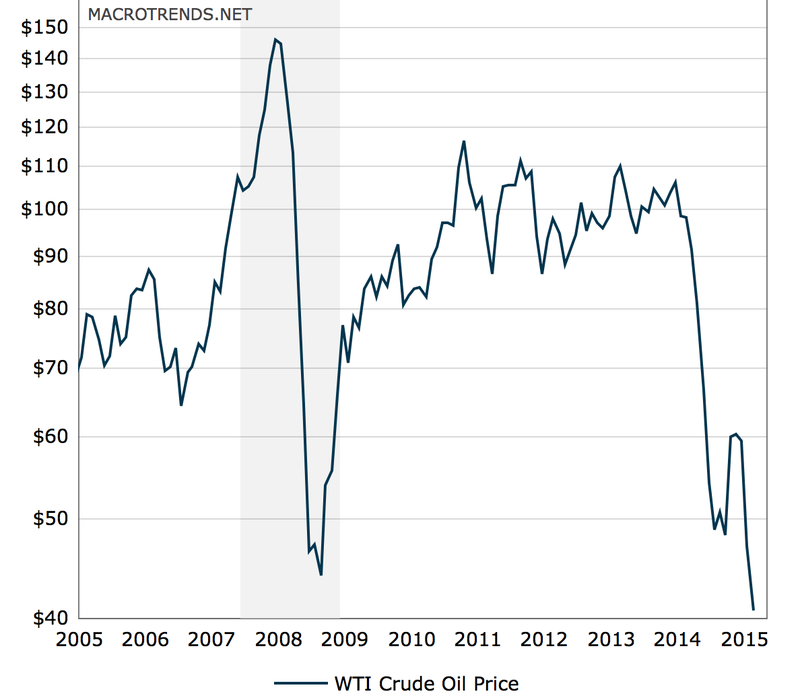 The market is is contango so it makes sense to hold back oil from the market. Money can be made by storing and hedging. The current price decline is consistent with what we are seeing with the high production. "Ocean liner without life boats"
"monetary policy may be more frequently constrained"
"more limited than usual, but they're not zero by any means"
One of the chief concerns of money managers who look into the more distant future (for money management that can be out over a year) is the fear that there Fed does not have any firepower to mollify the next recession. There is no good words to describe this problem, so we use these military analogies. This is a policy problem that will have real effects on asset markets. Given all of the monetary stimulus, the Fed has not been able to push up long-term growth. It was very good as solving the initial liquidity crisis, but the cost has been to push up asset prices and create a wealth effect that actually increased income inequality. Now there are limited alternatives. If asset prices decline from a turn in the business cycle, there will not be the ability to lower borrowing costs. Direct purchases of Treasuries will increase bank reserves but there already is an excess of bank reserves. The direct purchase of assets is another alternative which opens a different set of issues with risk shifting from markets to the Fed balance sheet. Assume we have a more classic business cycle with excess inventories and a need for production declines to gain equilibrium. Central bank tools will be limited. Firms and individuals will have to look to fiscal stimulus or just learn to live through the downturn. The discount rate change will not be able to offset the declines in earnings. This will be new uncharted environment. The Federal Reserve Bank of New York has started a multi-part series on liquidity in the Treasury market. The issue of liquidity has been a growing concern market participants, but the evidence presented by the Fed on this issue is exactly not clear. 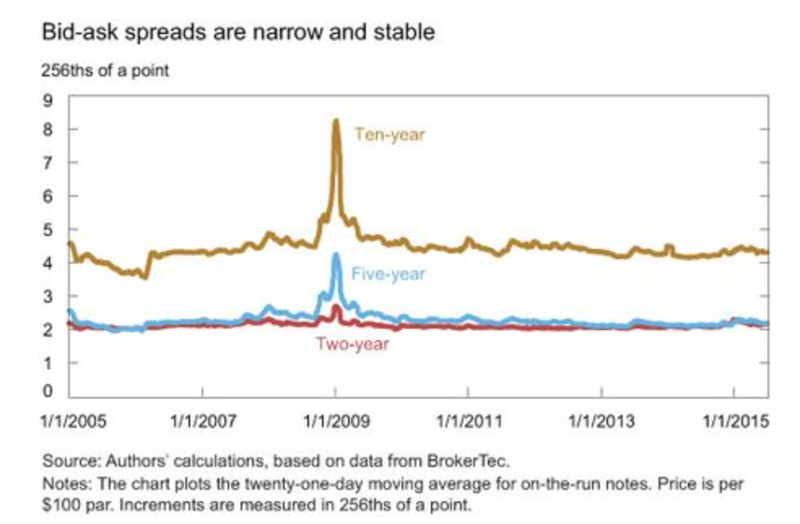 The bid-ask spreads for Treasuries has remained stable. Depth in the market has declined from highs. 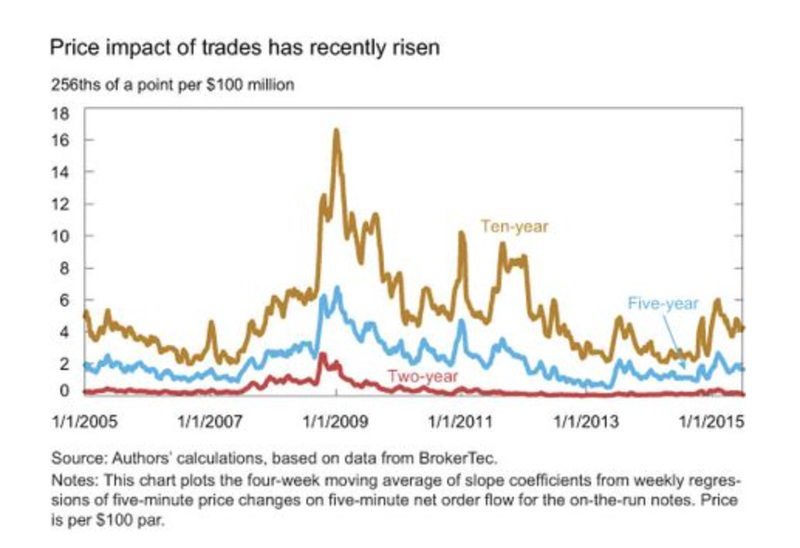 Trade size has declined which seems to suggest that the market is adjusting to less liquidity. Yield curve errors or dislocations against a smooth Treasury curve have not increased which suggests that there is no shortage of liquidity for off the run Treasuries. 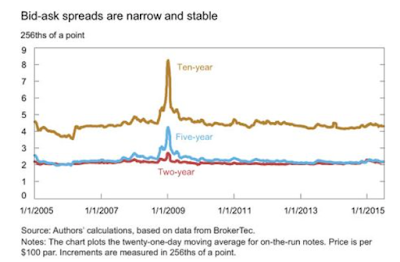 Refcorp bonds that are substitutes for Treasuries have higher spreads but are stable. The key statistic may be the market impact of trades. This series has shown more volatility. This may represent our best measure of liquidity risk, or to be put more clearly, illiquidity risk. Showing that there is market liquidity is not the same as not having liquidity at specific times. This is a classic black swan problem. Counting white swans of past liquidity does not tell us whether we will have a black swan liquidity event. The fact that market impact has become more volatility especially in the 10-year sector suggests there is more risk of any trade having an impact. The Fed would like to put liquidity concerns to rest. Their evidence sheds good light on the problem but does not solve the perception of illiquidity risk. 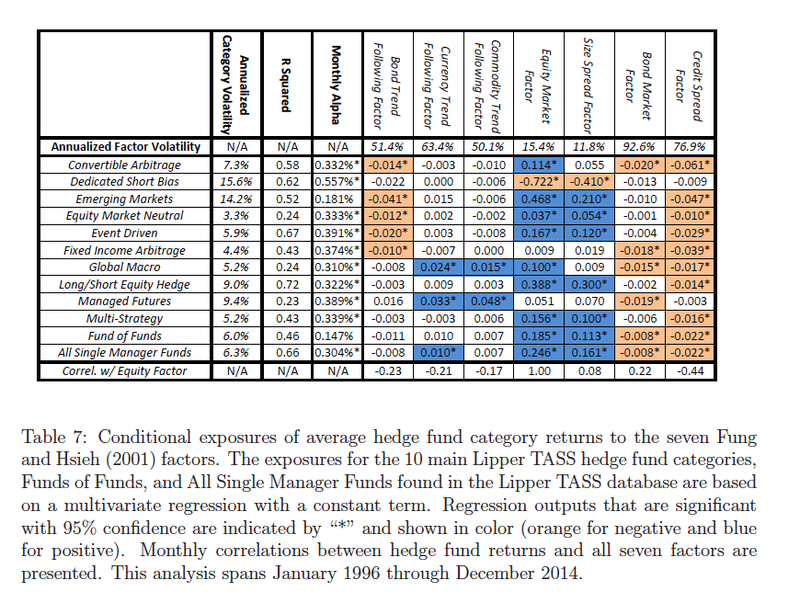 The new study "Hedge Funds: A Dynamic Industry in Transitions" is a treasure trove of information on hedge fund behavior of the last two decades. 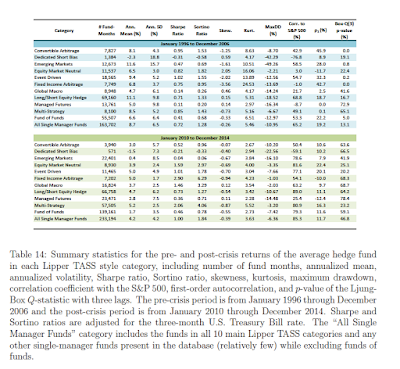 Written by Peter Lee, Andy Lo, and Mila Getmansky Sherman, it by far the most informative analysis of hedge funds to date. I will highlight some of their tables and figures with a focus on my special interest of global macro and managed futures. 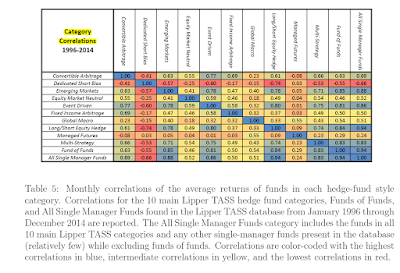 A look at the correlation matrix of across hedge fund styles shows that an investor who wants diversification should focus on managed futures and global macro. While short bias has a strong negative correlation, its correlation is based on a tilt away from long equity holding. It will generally do well only in down market scenarios. Managed futures and global macro, given the wide set of asset classes traded, will have the greatest natural diversification in either up or down markets. The key to these two styles is that they are different. 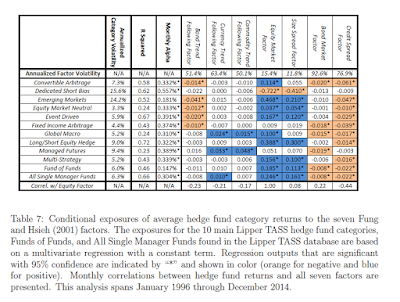 Each hedge fund style has different conditional exposures to market factors. These differences to linear factors are what creates the correlation differences. 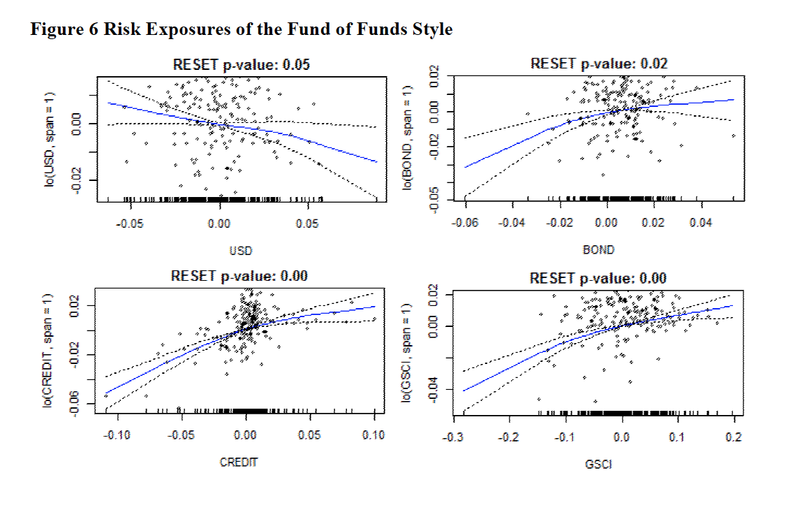 Managed futures and global macro provide exposure to commodities and currencies relative to other hedge fund styles. Global macro has an equity factor focus that is not found in managed futures. 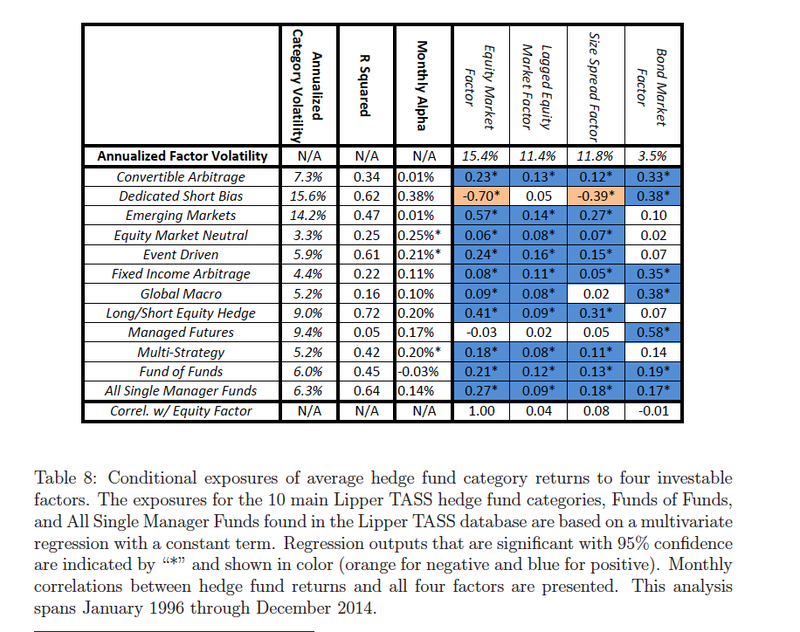 Most hedge fund styles have significant equity exposures. There is a cost associated with this diversification. Managed futures and global macro volatility will be higher and the amount explained by the seven factors tested will be lower. Both styles have a higher level of uniqueness as measured by their low r-squared values. Using a four factor model, an investor will get different factor sensitivities. For managed futures, there is no equity sensitivity, only sensitivity to the bond market. Global macro has a slight tilt to equity exposure but no sensitivity to the size spread factor. One of the problems with using these linear factor models is that the ability of a seven or four factor model to explain out sample behavior is poor especially for managed futures and global macro. 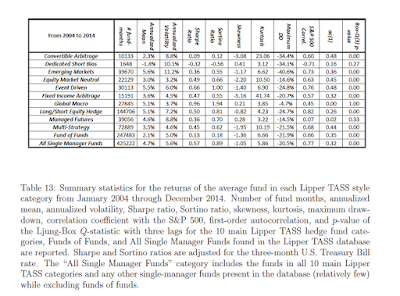 There is a strong out of sample link between linear factors and long/short equity for the simple reason is that these hedge fund managers have a more narrow focus. The performance across years is highly variable with the best style of three ago is not the best today. The top performing hedge fund style will change from year-to-year. 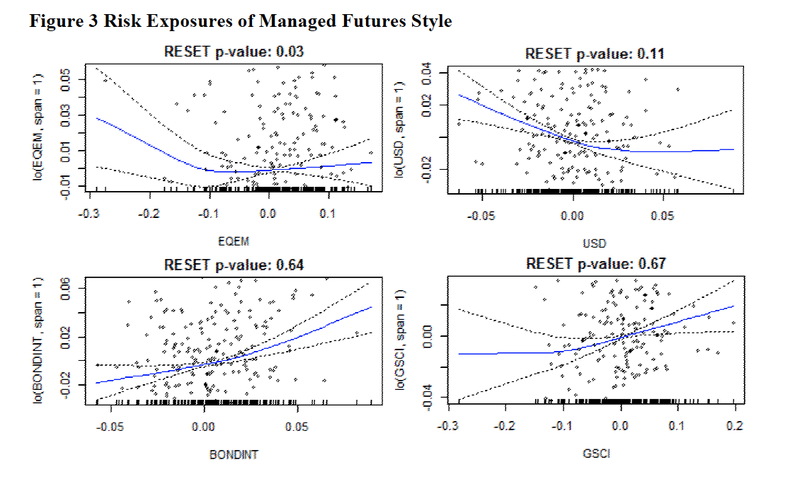 Managed futures will do well when other hedge fund styles under-perform. The same applies to global macro; however, the 2011-2013 was not kind to strategies that had broad exposures. The overall performance statistics tell an interesting tale. Beyond volatility, managed futures and global macro have better skew and kurtosis characteristics and the maximum drawdowns are actually lower over the entire period. Performance has changed in the post-crisis period with the ascent of multi-strategy and fixed income arbitrage as having good risk-adjusted returns. Global macro provides good risk-adjusted returns while managed futures have shown a larger relative drawndown. Clearly, performance ha been dynamic and does not follow long-term patterns. The highlights we have shown is just a sample of the data and facts available from this study. It shows that manage exposures and carefully picking the right managers and strategies is essential for successful hedge fund investing. 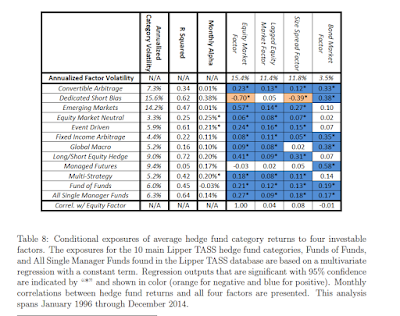 What is the value of hedge funds - convexity! Let me say it again, convexity. The ability to provide non-linear pay-offs to key market factors. Hedge fund managers show skill when they are able to change their exposures based on the set of linear factor opportunities. However, measuring this skill is not easy. Markets are competitive and highly efficient, so not everyone has skill. 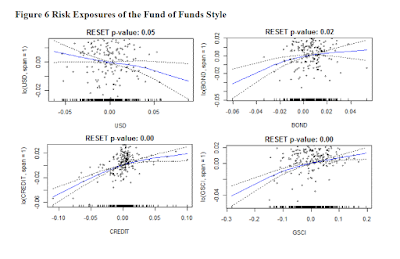 A recent research paper called "Passive Hedge Funds" takes a provocative approach to describing and measuring hedge fund performance using non-linear regression techniques. Skill should be the ability to increase returns through active management in a manner that is better than just having linear exposures to risk factors. For example, a manger that has sensitivity to a linear commodity risk factor should do better than the "beta" in up markets and not lose as much in down markets. If a manager just has a linear exposure to that factor, he is more of a passive manager. Having passive exposure may not be bad, but it may not be skill-based. 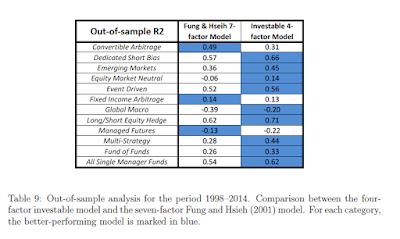 The authors argue that most hedge fund managers are passive to some linear factors and hence do not have any skill. 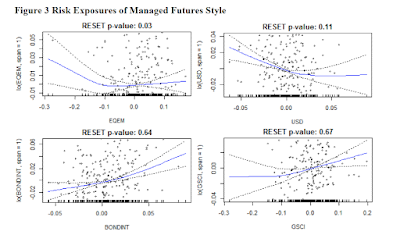 These managers do not have skill as defined by the nonlinear exposure to systematic risk factors. I will call this skill, convexity to a linear factor. 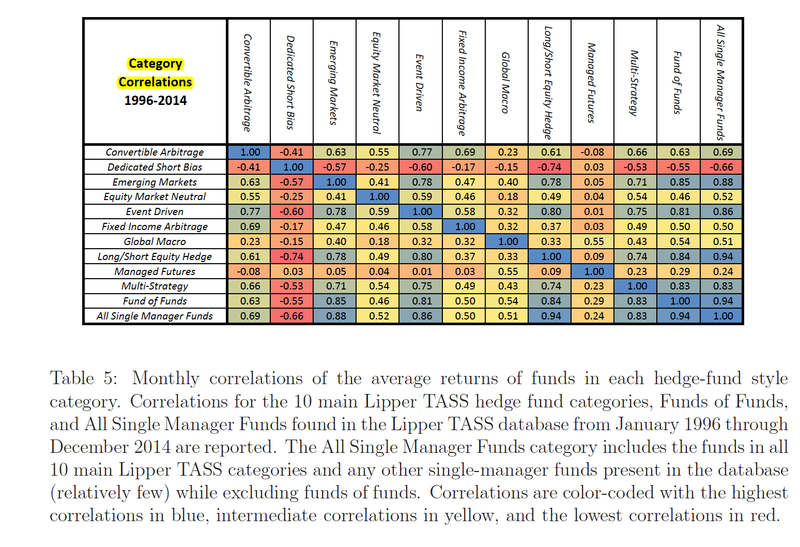 2/3rds of hedge fund managers have linear returns tied to well-defined factors. Hence, these are passive managers in that investors could form similar portfolios through combining these linear factors. These managers do not do better than passive exposure. Nevertheless, there are differences in hedge fund style behavior. Here are three example of risk exposure for different hedge fund styles and their non-linearities or convexities. For managed futures, there is positive convexity with respect to the dollar, commodities, bonds and emerging markets. This is consistent with their broad exposure across asset classes and their focus on long/short trend-following. 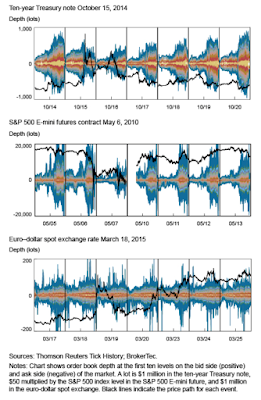 The global macro style shows a very different convexity profile with negative convexity to volatility and the dollar. Fund of funds have a native convexity profile to bonds and credit which is consistent with relative value trading. Do not assume that all hedge fund managers are special or the best of the best. Skill analysis through due diligence is necessary. All hedge fund styles are not alike, and not all hedge fund managers are skillful within their style. 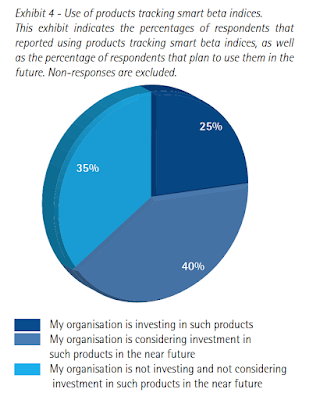 A recent EDHEC survey of global investors show that smart beta ETF's is picking up investor interest at a fast pace. This is a simple direct way to get factor exposures with transparency. The definition of smart beta at its simplest form is a catch-all for non-market cap weighted portfolio. It can be anything from an equal weighted portfolio to something like a growth or sales-weighted factor. We can say that there has been the development of different generations of smart beta with 1.0 being fixed factor weights and smart beta 2.0 being flexible factors or exploitation of allocations within a factor. 25% of survey respondents have already used smart beta products and 2/3rd are either using or considering the use of smart beta products. The ETF form has made it very easy to get in and out of the market and make asset allocation decisions. Smart beta ETF's is being used as a tool just behind the main asset class ETF's. 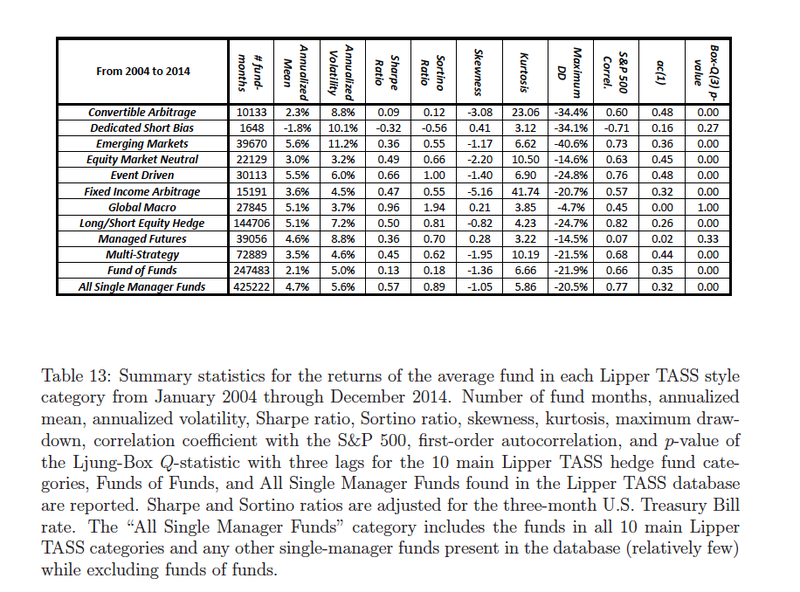 It is going to be a harder argument to use a actively managed mutual funds when there are cheap smart beta available. We think that the smart beta demand will lead to more interest in global macro investing or more precisely dynamic and tactical asset allocation. There will be a premium on making allocation decisions across risk premiums and asset classes as opposed to picking stock based on factors. You can buy factor betas, but now you have to determine the sizing in the portfolio and the adjustments as the factor performance change through time. Enterprise - "Forecasting the prospective value of the asset over it entire life. " Speculation - "Forecasting the psychology of the market." "When enterprise becomes a mere bubble on the whirlpool of speculation, the job of capitalism will be ill-done"
Are we in a whirlpool of speculation? Seems like it depends on which asset class. With a clear focus on Fed action, there is little talk of the enterprise value in fixed income. A similar story could be applied to equities when the focus is on Fed policy. There is value with trying to balance analysis on enterprise value and speculation. Both are needed but they have to be weighted effectively versus what others are doing. Unfortunately for the trader, if the market as a whole focuses on speculation spending time making bets on enterprise will be a losers game in the short-run. 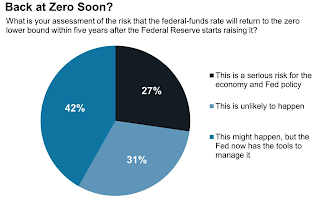 Recent surveys have stated that over 80% of economist thing the Fed will raise rates in September. 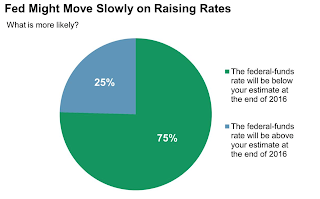 This is in conflict with expectations from the Fed fund futures which suggest that rate is a flip of a coin at 48%. To get the same probabilities as the economists, you have to to look at the end of the year. The market is at odds with economists and the Fed based on the signals they have provided. It is notable that the market earlier in the post-crisis period expected the Fed to raise rates sooner. They were ahead of the curve and disappointed. It is being more cautious. Survey information gets even more convoluted. A WSJ survey has rates returning to zero over the next five years at more than 50%. 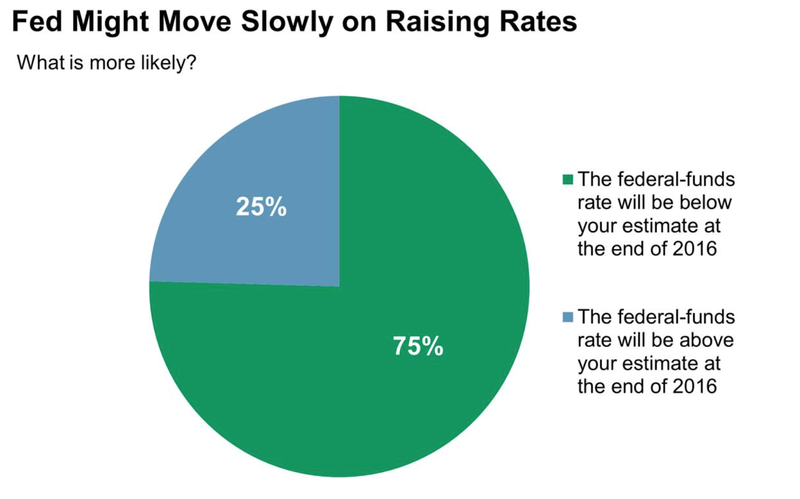 In the same survey, there is a 75% chance that the Fed will rise rates at a slower pace relative to current expectations for the end of 2016. The sell-down of the Fed balance sheet is also highly uncertain with only 50% of economists thinking that it will come in the next nine months. This high level of uncertainty even with the Fed is providing a lot of market opportunities for traders to take bets versus the consensus. 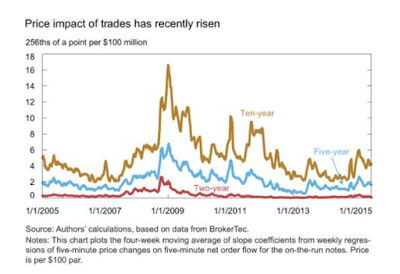 This has revived trading volume for interest rate products at the CME. Researchers have shown that there are clear limits on our ability to retain information in short-term memory (STM). The classic work on short-term memory retention focuses on seven plus or minus 2 as the number of pieces of information that can be retained by anyone. More recent research but still relatively old at 25 years, suggests that the magic number is actually lower, at 4. (See Nelson Cowan.) The overall conclusion is that the short-term memory for most is pretty low regardless of our training. You can get better, but there are natural limits for most individuals. Are there ways around this memory problem? Yes, one of the systems used to get better memory is chunking or grouping together items to generate more STM storage. Now try, FBI - CBS - IBM - IRS. This is a lot easier. If we can condense and chunk, we can remember a lot more. You can say that some technical systems are a form of chunking to offset the problem of short-term memory. Take the simplest case of price direction. We may not have to know the level of every market that we are long. We can chunk the data by just determining whether the price is above or below a trend. Instead of a long number with many digits, we can remember a chunk for (+). We can chunk four technical signals over a lot of fundamental information. A lot of rules-based investing is about condensing information to meet STM issues and store more information about many markets. Even if a computer can store more information, the investor has to process a set of comparisons. There are limits, so tools have to be developed to fight the natural limits of memory. Systemic risk is the risk that a relatively narrow shock, such as the failure of a particular company, will propagate quickly and broadly throughout the financial system and to the real economy. It is the opposite of systematic risk, which measures the extent to which movement of a broad market or economic factor imparts risk to a narrow entity such as an individual company. - Kinlaw, Kritzman, and Turkington "Toward Determining Systemic Importance"
I really like these simple definitions of systemic and systematic risk. It is good to review these definitions when we are faced with some possible systemic and systematic risks. I think we may say that a China devaluation may turn into a systematic risk. We cannot say for sure until after it starts to affect global markets, but this somewhat isolated event may have spill-over to all asset classes. A decline in the China stock market could be viewed as a systematic risk that will affect many individual stocks. It could turn into a systemic risk if starts to carry across multiple asset classes in unexpected ways. Could these definitions be splitting hairs? I think the Greece crisis was systemic risk and the potential bankruptcy of Puerto Rico could be a systemic risk. The Fed raising rates represents more of a systematic risk. Systematic risks are those that we can be clearly measured. We can find a "beta" for the sensitivity to a rate increase or a stock market decrease. A systemic risk is harder to measure. There is no beta that is measurable for these more one-off events. We may be able to measure linkages across markets and sectors, but whether a shocks will take hold cannot be easily determined. This is what makes systematic risks so nasty and why there is a need to deeply think about "tail risk", hedging, and diversification. The currency markets have been a place of renewed interest by investors. With the dollar in one of the strongest trends in years and continued divergence in monetary policy and growth, there are good fundamental reasons for selling other currencies. There is also reviewed interest in exploiting interest differentials, that is, to play the carry trade; however, one of the key lessons of the financial crisis has been that carry trades can be extremely risky. You just have to ask an emerging market carry trader who has financed his positions with dollars. 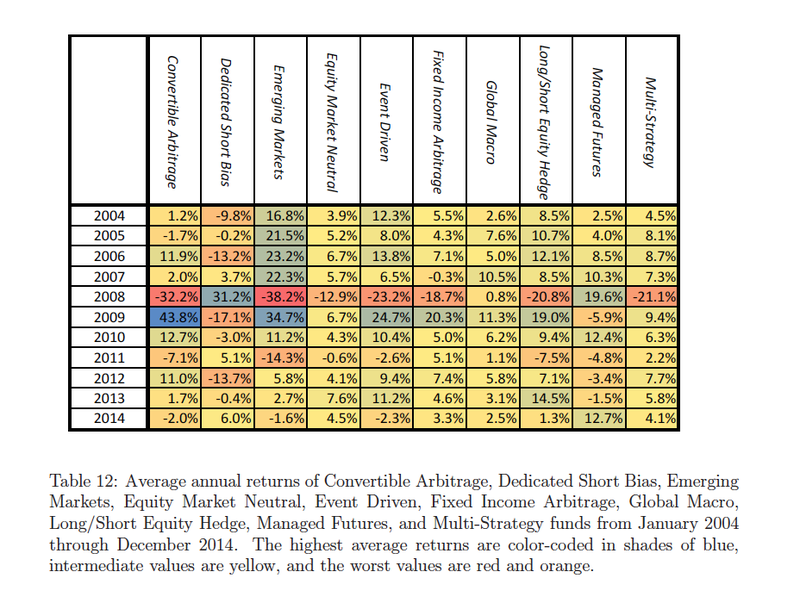 The high average returns for carry strategies are coupled with high negative skew and drawdowns. The high returns need to offset these risks. Recent research work has again focused on the risks associated with carry trades. 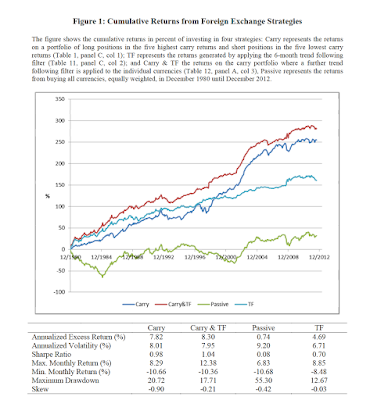 See "Carry and Trend-following Returns in the Foreign Exchange Market". While the authors focused on trying to explain the risk premium with carry, they found that trend-following seems to be a good hedge for carry trades. Carry plus trend-following is a nice combination of strategies that provides a good return to risk. 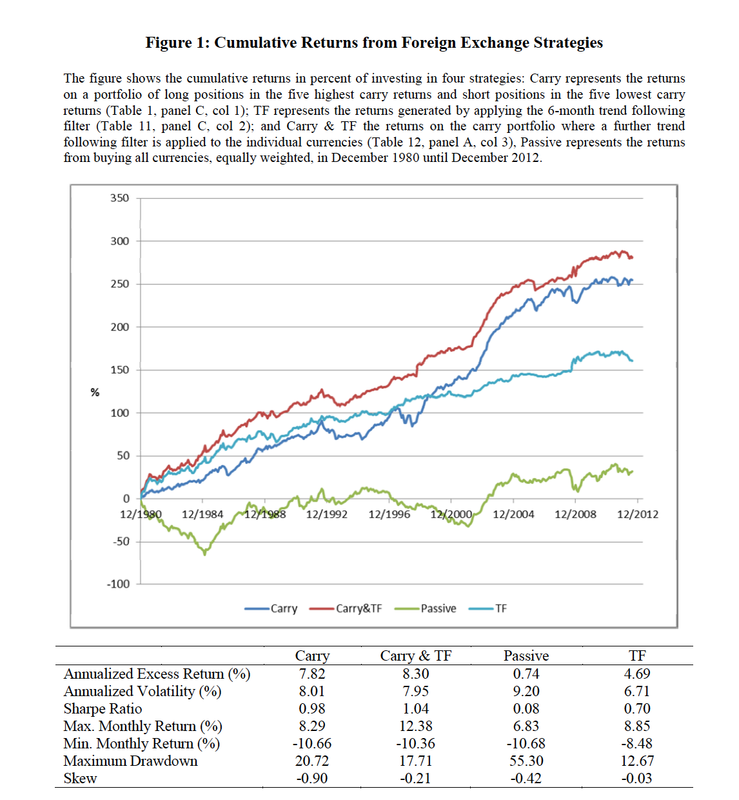 The research focused on the risk associated with carry and found that a liquidity risk premium seems to do a good job of explaining the volatility and return profile of a carry strategy. Many have known about this from trading the strategy. Simply put, when risk aversion increases or there is a risk-off environment, the smart money should get out of carry. No matter how you measure it, if there is a liquidity problem, it is time to step aside from carry. At the same time, this can usually be a good time to hold a trend-following strategy. So if you balance carry with trend-following, you will have a good natural hedge profile. This combination is suggestive of what we have said before about convergent and divergent trading strategies. (See momentum and mean reversion traders - they co-exist. We have also written on the dangers carry in the past.) Momentum strategies should do well when there are market dislocations or divergences. Mean reverting strategies or those that do better when markets are stable such as carry are convergent strategies. These two strategies can co-exist and can be combined to make for a better portfolio of different strategies. Work in the FX market have suggest that carry and trend are two of the key beta strategies in the FX markets along with fundamental and volatility factors. Hence, it would be natural for carry and trend to combine for a better portfolio. This recent research just reinforces this combination story as a core approach to trading the FX markets. 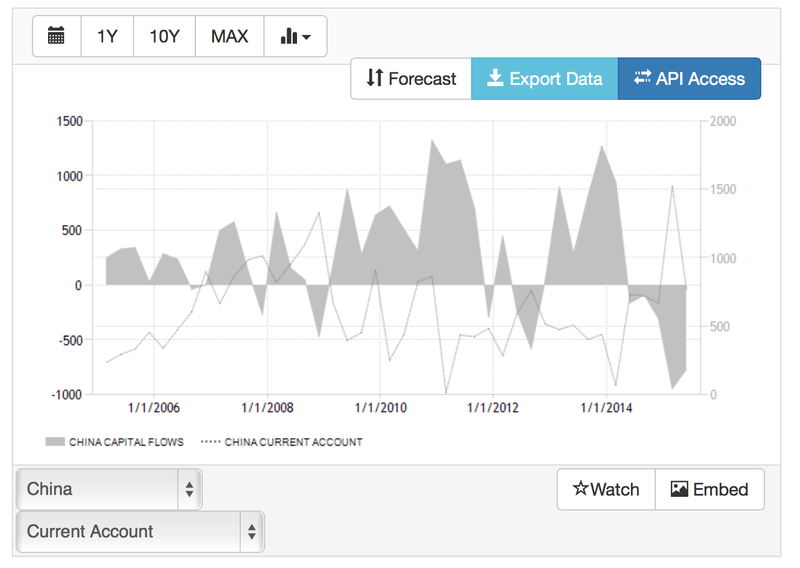 You cannot think about the Chinese currency devaluation without also reviewing their current and capital account. A close look shows that there has been significant changes over the last few years. Not keeping up with the China trade and capital flow story will give many a misconception about China and the foreign exchange market. The balance of trade is still in a surplus although it is starting to trend down. 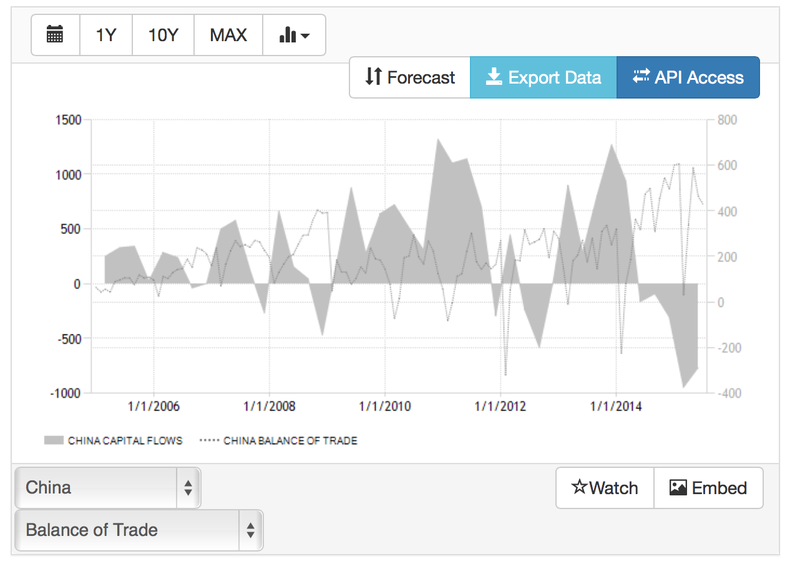 The trade surplus is still higher than two years ago even with higher volatility. The close link between the dollar and CNY over the last few years mean that the CNY has moved higher versus other currencies. This link may have hurt trade, but the bite from currency appreciation has not crippled the trade surplus. 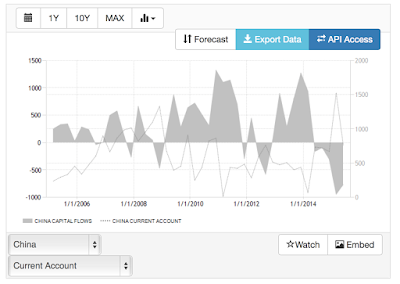 The trade surplus and income flows form the current account which has generally moved to post crisis highs. By identity a current account surplus should be matched with a capital account deficit. Any differences will be made up in the official account. China has generally been in a current account surplus as well as a capital account surplus which leads to an increase in foreign reserves. This balances the international trade and capital flows. The current large capital deficit after a long period of surplus means official reserves will actually decrease. This has changed the activity of PBOC which has to balance the international accounts and controls the money supply. Under conditions of large capital account outflows greater than the current account, the normal expected adjustment will be a depreciation of the currency. If the depreciation is small relative to what is expected or if there is a continued overvalue of the currency, markets will place more pressure on the central bank. This is what we are seeing in China. Traders are faced with making fast decisions under uncertainty with limited information. 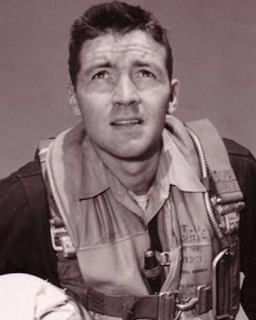 This is not different than what an air force fighter pilot will face when engaged in combat. He has to process information quickly and learn to decide and act just as quickly. Speed and success are difference between life and death. This necessity to act fast is why the thinking of John Boyd, the air combat strategist, is applicable for helping any trader or manager who has to make quick decisions as new information enters the market. I think Boyd's action loop is a good foundational approach to developing research for any systematic trader. The loop is called OODA - Observe, Orient, Decide, and Act. It is simple enough and may seem obvious, but that is what makes it so effective. Keep it simple and something that can be ingrained in thinking. Like any good research process, the first step is to observe the environment and understand the new and unfolding information that is entering the market. Decisions cannot be made in a vacuum. The second step is to orient or place the observation in context. Facts or observations are not enough. The information has to be placed within the overall market conditions such as central bank behavior or the business cycle. From placing observations in context, the next step is deciding what action should be taken. This is the hypothesis or the form of what is to be the outcome of the new information. The final part of the loop is to act on the decisions. Forecasting or deciding without action is wasted effort. Of course, each of these steps require or will have feedback through the loop If action is taken, that has to be fed back to new observations and thus through the steps of the loop. If this process repeated enough times with the same type of information, there can be systematic or disciplined rules for action. This is the foundation of any money management model. From following repeated loops and feedback come success. 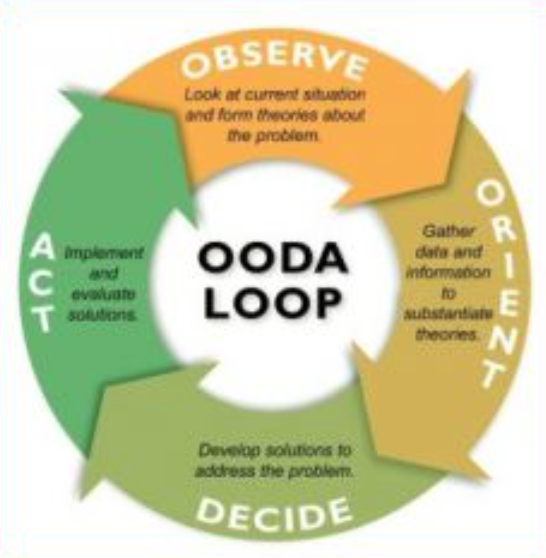 Since this OODA loop can be applied to past data, it is the foundation for back-testing. The skill of a trader is related to his ability to follow these steps and do them better than his peers. 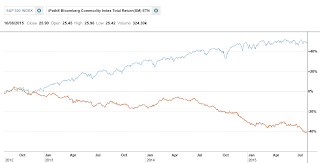 Should a pension hold commodities? You have got to be kidding, a rationale for holding commodities at this point in the commodity cycle? 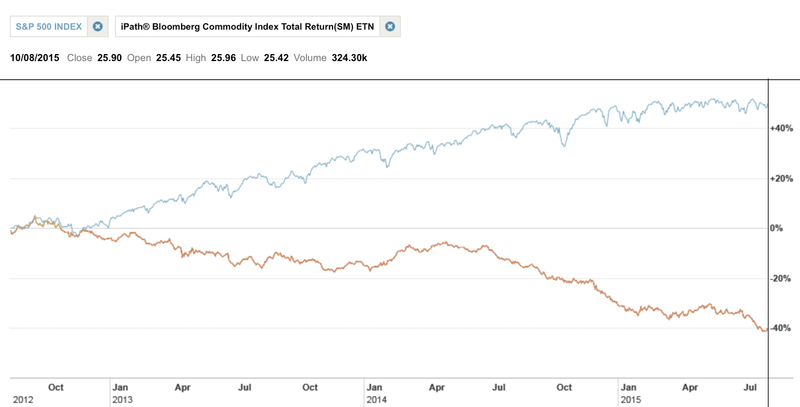 The commodity markets have not performed well over the last few years. 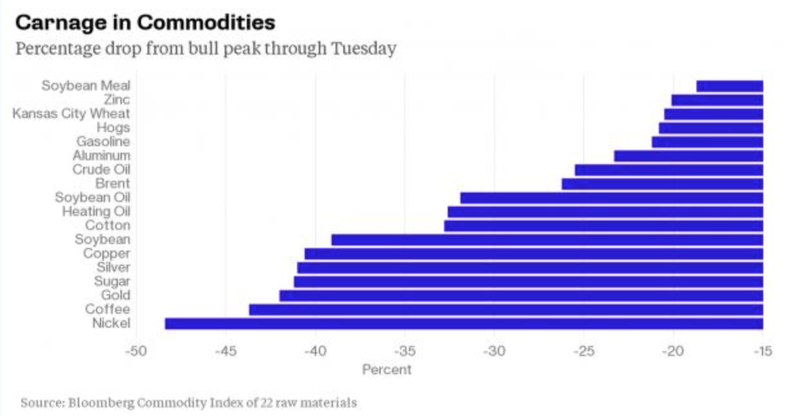 Right now 18 of 22 markets in the Bloomberg commodity index are in a bear market with declines of 20% or more. Any uptrend in the commodity super-cycle is over and the gains in financial asset markets from QE have not been seen in the commodity markets. This is different from 2008 when the commodity market crashed on a decline in demand. Now we are seeing a crash on oversupply. The long-term demand trend never really came back and the producers continued with supply hoping for a better day that has and will not likely arrive. Rationalization on the producer side has to continue and this takes time. 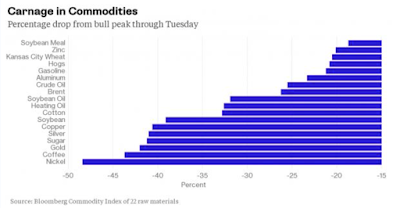 The commodity markets have moved in a different direction than equities. There is a growing divergence between these two asset classes and this cannot continue. Commodity producers are a smaller portion of the overall market capitalization but there will be a further spill-over to earnings and credit quality. With all of this negative performance, the question is why should investors hold commodities in their portfolios. Diversification seems like a good idea, but the return drag has made this decision a costly proposition. Inflation may have seemed like a good idea to hold commodities, but again, it has not been realized. In a sub-2% inflation environment, there is little that long-only commodity trading will generate for investors. There are a couple of issues that have to be highlighted for potential commodity investing of a longer period. First, many forecasters expect that growth with pick-up in 2016. Raising rates is never good for commodities, but if it serves as a signal of stronger growth, there could be a case for commodities. Second, supply tightening will start to occur as we move through time with these low prices. Commodity expectations have to suggest that prices have fallen and will say down for some time. Supply responses are adaptive and slow. The fact that oil has fallen a second time to low levels will start to impact producers. That impact does not help any investor in the short-run; however, a reduction in excess supplies and increased demand will allow for price behavior that makes more sense with respect to fundamentals. Finally, with commodities still having high volatility relative to other asset class, there is an opportunity for better relative value trading. This should apply both within the commodity sector and across other hedge fund styles that are chasing low alpha in a stable environment. The water may not be fine but weather can change and for those with a tilt to relative value, there can be some good opportunities. Smart versus alternative beta - who can define? Risk parity - what is going on?